As I sit at my desk after a restful period of annual leave, much of which was shrouded in rain, drizzle and fog, as well as unseasonably cold temperatures, I have to ponder why I am not lamenting the end of a long and much deserved summer break. In fact, as I left home this morning, I couldn’t help but notice a twinge of excitement – certainly something I would never share with my co-workers. It is true – the thought of returning to work conjures up unexpected feelings of exhilaration. The only explanation for this is that the workplace to which I am returning is the Centre for Nursing Studies (CNS), which is operated by Eastern Health. 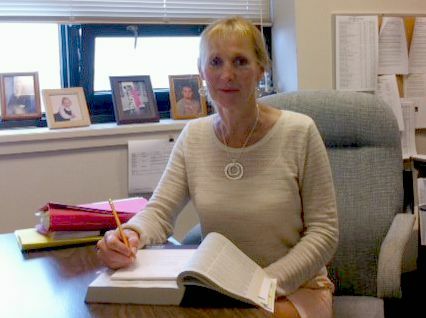 Lorna Walsh, faculty member and Year 1 and 2 Coordinator of the Bachelor of Nursing (Collaborative) Program at the Centre for Nursing Studies. To coin an old phrase, it seems that only yesterday the three schools of nursing transitioned into the present CNS. If anyone asked me to respond without giving thought to the timeframe, I would say about 10 years ago, but certainly not close to 20! It was with some trepidation that faculty from three diploma schools of nursing, including the St. Clare’s Mercy Hospital School of Nursing, the Salvation Army Grace General School of Nursing and the General Hospital School of Nursing, came together in 1996. I remember the talk well – how would we ever form working relationships with faculty from our “rival” schools? I remember the conversations in which we joked about which school was superior. We all knew though, that deep inside we had the same vision, and that was to make the CNS a world class institution! Well, I am happy to report that those relationships have formed, and we stand today as one united faculty. I’m Lorna Walsh, and in the 19 years that I have been part of the CNS, I have had the privilege of working alongside passionate leaders, innovators, scholars and committed educators who all strive to produce the best possible future nurses. I work with nursing faculty who support each other, who embrace change and who inspire me every day to do the best I can in my chosen career. With each faculty retirement, I feel the loss of years of experience, knowledge and wisdom; however, this void is quickly filled by new, young, invigorated faculty who bring with them a new perspective, a new energy and a new way of thinking! It is sometimes their youthful outlook that helps us better understand the students of today. I have seen the contributions of senior faculty and junior faculty merge to ensure that we continuously adapt our approaches to nursing education for all students in all programs. Oh yes, I still see robust discussions between faculty on a regular basis. It is not because we do not work well together or because we lack respect for each other, but rather because every faculty member at the CNS has something to offer – a passion for some contribution to help ensure that every student receives the best education possible. 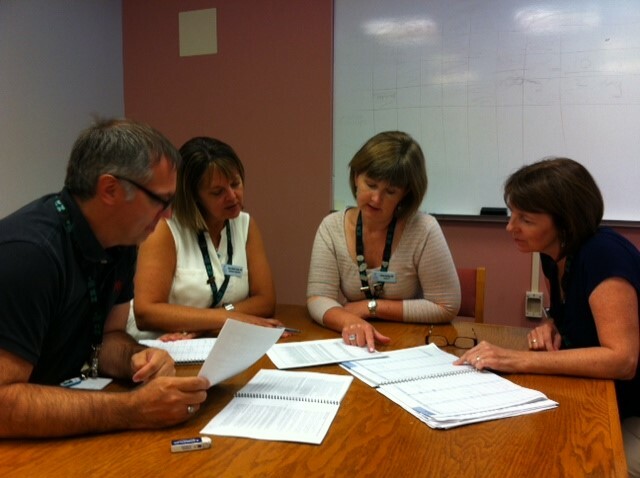 Faculty members of the Centre for Nursing Studies in discussions. With guarded anticipation, we opened our doors in 1996 to the first class of 120 eager and enthusiastic Bachelor of Nursing students – 120 of the best and brightest. They laughingly called themselves the “guinea pigs” as they progressed through the challenging four-year program, but we knew different. We knew that they were being guided by years of preparation – years that blended the strengths of the three diploma programs offered over so many years with the progressive and broad-based learning philosophy of Memorial University. 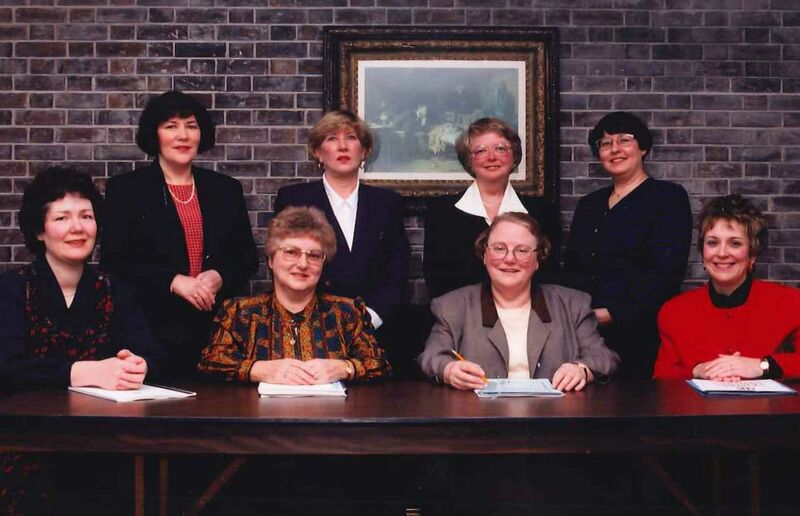 Members of the Transition Team that brought together the St. Clare’s Mercy Hospital School of Nursing, the Salvation Army Grace General School of Nursing and the General Hospital School of Nursing in 1996. One of my proudest moments is when I call the names of the graduates during their final award ceremony – the same students who, less than four years before, entered the doors of the CNS. I called their names at that time as well – during orientation to year one. I think of how during that first roll call their faces displayed bewilderment and apprehension as they sat there surrounded by strangers, each feeling as overwhelmed as his/her neighbour. On graduation day their faces are full of pride as they stand amongst those with whom they have made lifelong friends; as they stand together with families who have seen them through four challenging years; and as they stand amongst colleagues who, just yesterday, were their faculty. I am so proud to have played a role in this remarkable transition. And, I am so proud when I see them as staff nurses and as leaders in Eastern Health and other organizations. You will note that as a faculty member in the BN (Collaborative) Program, my reflections thus far are related to that program, but certainly the CNS is much more than that. It is currently the largest nursing school in Newfoundland and Labrador. In addition to the BN (Collaborative) Program, it offers the Practical Nursing Program, continuing studies programs (post-basic courses) for Registered Nurses (RNs) and Licensed Practical Nurses (LPNs), re-entry programs for RNs and LPNs, a tailored bridging and re-entry program for internationally educated nurses (IENs), and competency-based assessments of nurses in practice for the Association of Registered Nurses of Newfoundland and Labrador (ARNNL), the College of Licensed Practical Nurses of Newfoundland and Labrador (CLPNNL) and regional health authorities as requested. The CNS International Office has worked closely with nursing schools, professional associations, community agencies and health ministries in developing countries to improve health status and strengthen health systems in order to help these countries achieve the Millennium Development Goals for Health. Also, facilitated by the International Office, the CNS Practical Nursing Program was brokered to several sites in Jamaica. The Centre for Nursing Studies’ Research Office exists to facilitate the scholarship of research by faculty, to promote research and evidence-informed practice by nurses of Eastern Health and to encourage research partnerships between nursing education and practice. Our current enrollment is close to 750 students. We have approximately 50 full-time faculty members with a similar number of sessional faculty members at peak times. While this alone is impressive, it is our accomplishments that are even more impressive. There have been over 1,600 graduates from the BN program – a program that has celebrated three seven-year accreditations from the Canadian Association of University Schools of Nursing! This is the highest possible accreditation status in nursing studies, and very few schools in Canada can boast such success. The most recent accreditation was June 2015, and remarkably there was not a single recommendation for improvement! The Practical Nursing Program has seen close to 900 graduates and that program too has been granted the highest approval award of five years from the College of Licensed Practical Nurses of Newfoundland and Labrador, three times in succession. Our Continuing Studies program boasts over 6,500 successful students since 1996. To date, The International Office has received almost $7 million dollars from the Department of Foreign Affairs, Trade and Development to complete needs assessments, technical studies, development projects and program brokering in Bolivia, Chile, Dominica, Ethiopia, Nicaragua, Guatemala, Jamaica, Malawi, Paraguay, and Trinidad and Tobago. It is hard to believe that 2016 will mark our 20th year anniversary! While plans for the celebration are underway, we will be encouraging all of those for whom the CNS was a part of to celebrate with us. For those who have graduated from any of our programs, together with us, you can stand up and be proud that you are part of our wonderful success story. This story was written by Lorna Walsh, faculty member and Year 1 and 2 Coordinator of the Bachelor of Nursing (Collaborative) Program at the Centre for Nursing Studies. I had the pleasure of working on the committee who developed the curriculum for this BN (Collaborative) degree Program. It was a time of creating exciting objectives with exhilarating debates over what was absolutely needed to successfully implement a vital program such as this. Members from each Nursing School including Memorial University School of Nursing.shared, prioritized and analysed our objectives as a framework was created to achieve what was necessary to implement a new Curriculum and a joint faculty. Now, almost 20 years later, the graduates from these programs are testaments to the value of a program such as this and show how crucial the profession of Nursing continues to be as it evolves in its multi-functional/multi-dimensional roles. This is an exciting and invigorating time for faculty, graduates and students alike. Very nice reflections on the journey and achievements of the School. Congratulations. As a member of the first graduating class from CNS BN Program, I can attribute my successful career to the foundation that I received at the Centre.